On Saturday 5th and Sunday 6th November, our vets were called to attend two incidents in the same field at our Piggots farm. Very sadly, in both cases the horses involved were put to sleep. 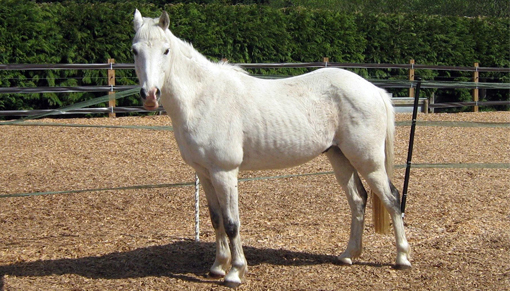 Nineteen-year-old, Welsh pony Sprite (above) was found on Saturday evening suffering from suspected colic; he was lying down, covered in sweat and breathing heavily. “Although it may have been a coincidence that loud fireworks were being let off nearby, it is possible that Sprite’s colic could have been brought on by the stress of him and his group charging around the field,” commented attending Redwings vet Dawn Trayhorn. “Heartbreakingly, despite treatment and his field mates pawing at Sprite to try to make him stand, he was unable and unwilling to get up so our only choice was to put him to sleep”. Sprite’s field was later checked to ensure the safety and wellbeing of the remaining ponies. However, during early morning checks, Percy – a 25 year old, 13hh Palomino pony – was found non-weight-bearing lame on his right front leg and in an incredible amount of pain. “Percy’s injury may have been caused while he was running around the field at high speed. He may have either had a fall or simply damaged his leg while charging about, or possibly even been kicked by another pony in their distress. And again, like Sprite, Percy’s injuries were to such an extent and he was in so much pain that there was no choice other than to put him to sleep. “We are all so upset by what has happened to Sprite and Percy. Both ponies were in their latter stages of life and normally very sedate, as well as used to living out happily all year round, so this behaviour is highly unusual and typical of stress. Although we can never know for sure, it is likely the incidents were as a result of nearby fireworks displays. “It seems to me that pyrotechnics have become stronger and louder in recent years so that means even so-called ‘private displays’ can still be very big and visible. It is extremely important that anyone planning a display, no matter the scale, who live near livery yards or land where horses are kept makes the effort to respect our animal friends and be aware of the potential devastating results of these celebrations”. If you’re concerned about your horse during firework season, we have produced a fireworks checklist which you can download here.